The stuff of the cosmos is organized in units we call galaxies. Galaxies consist of stars, planets, and nebulae. Dense concentrations of stars are called star clusters. Many galaxies are part of a larger organizational structure called “galaxy clusters”. Our Milky Way galaxy is part of a cluster of a few dozen galaxies called the “Local Group”. Some clusters are much larger than this. For example, the Virgo cluster has about 2000 galaxies. Clusters of galaxies are organized into even larger structures called “superclusters”. Superclusters form an intricate web of strings and voids of the visible universe. These large structures of galaxies are called "filaments", "supercluster complexes", "walls" or "sheets", spanning between several hundred million to a billion light-years. Superclusters are often divided into groups of clusters called “galaxy clouds”. 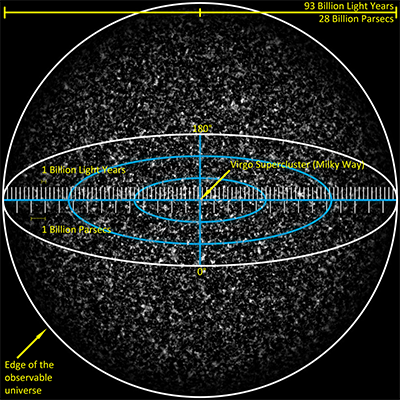 In the midst of these superclusters are large voids, in which few galaxies exist. Our universe, from as much of it as we can see, forms a three-dimensional structure that looks like 3 clover leaves connected to each other.